Cooling water temperatures will soon make live shrimp hard to come by. That’s not stopping Capt. Warren Dudenhefer (504-813-3474) from catching fish two at a time, though. In fact, he says that more anglers will be hollering, “Fish on!” around Hopedale as the weather gets cooler. Until the shrimp are completely gone, Dudenhefer said anglers could still fish the few remaining birds that are picking over the shrimp that the trout are driving to the surface. In this situation, try a live shrimp under a Cajun Thunder cork. Dudenhefer says that on the coldest days anglers should drop back to the deeper bayous, and slowly fish a live minnow on the bottom with a Carolina rig. This is a great way to land some awesome Southern flounder. As far as specific places to fish, Dudenhefer pointed out Lake Robin, Hopedale Lagoon, Four Horse Lake, the Twin Pipeline and Lake Amedee. All of these areas offer a variety of habitats for trout, reds and flounder to use no matter the weather conditions. Head on down Highway 624 to get all the fishing secrets you need to have a summertime slam. Capt. 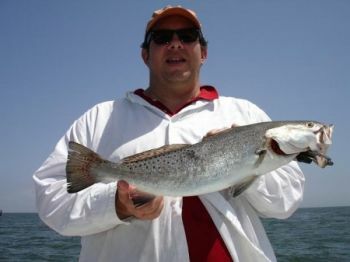 Dude, as he is more often called, operates Dudenhefer’s Fishing Charters out of Hopedale (504-676-3724). Dudenhefer has a deep secret that just boiled to the surface when pressed on the issue. In fact, his deep secret is to fish deep with live bait. The way Dudenhefer hooks the croakers on his Carolina rig is where the secret really begins. He uses big croakers, and he hooks them through the tail. Dudenhefer added that since trout swallow croaker head first to compress their fins, thus making them easier to swallow, a croaker hooked through the tail is much more likely to hook a trout in the roof or side of the mouth. Few places produce more fish than “Da Island” in the winter. 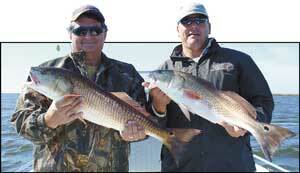 Dugas (right) gave one of the redfish he caught to the author (left) to hold for this picture. Another in a series of cold fronts had blasted through several days before, and the frigid north winds left the marsh almost dry and the temperatures way too cold for comfort. This was winter at its worst: low water, dirty water, cold winds and gloomy skies. But down here in the Deep South, those miserable grey conditions don’t last for long. The sunshine always returns in a day or two, and the southerlies begin to blow and the conditions change from gloomy to promising almost overnight. I had already postponed one trip with Capt. Gene Dugas (985-640-0569) due to the inclement weather, but the next morning’s forecast called for sunny skies, rising water and higher temperatures — a perfect day to get on the water, explore Delacroix and do some damage to the fish population. Canal just after sunup, and we tossed our gear aboard his 25-foot Team Avenger Bay Boat. The big boat is powered by a Mercury 225 Optimax, and in short order we ran across the marsh onto the Delacroix side and headed to Lake Amedee. “I have a basic route that I follow this time of year,” Dugas said. “I often start here and make a few drifts, and if I find fish, I stick the Cajun anchor over and try to stay with the action for as long as it lasts. “Sometimes you find them all stacked up, and you can limit out in one stop. Other times you catch a few on a drift and then go back and repeat that drift again. If one spot doesn’t produce, move on. Dugas says Lake Amedee has a tendency to stay clean when windy conditions muddy up other areas. And it acts as a huge drain for all the surrounding marsh, so when north winds push the water out of the marshes, the fish often stack up in the big lake to ambush the bait flushing into it. Dugas says he prefers casting Bayou Chubs in glow/chartreuse or avocado/red or H&H sparkle beetles in chartreuse, glow, motor oil or purple, all on ¼- or 3/8-ounce jigs, depending on the current. His other favorite weapon is a MirrOlure Catch 2000, which he believes attracts bigger fish, and the redfish will nail it also. We made a couple drifts along the north shoreline and put a few specks in the boat. “You can also drift just like this down the center of Tanasia Lagoon and catch trout or close to the shoreline and catch reds,” he said. It was a beautiful, sunny day, and we all had the itch to explore, so Dugas fired up the outboard, and we ran through Petain Lagoon, up Bayou Terre aux Boeufs and down a pipeline toward the Twin Pipelines. Our next stop was at the Twins and Lake John. Dugas pulled the boat just off the pipelines and stuck the anchor. “On colder days or in the early mornings, cast into the pipelines and let your bait go to the bottom,” he suggested. “Then just slowly retrieve it, working it up the ledge. Remember, the winter bite is not aggressive. They don’t nail it like a summer bite. You might just feel a little resistance as you reel in, like maybe you’ve snagged the bottom. Whenever you feel that, set the hook. That’s probably a trout. Dugas said the pass in the back of Lake John between the lake and the no-name ponds is deep and an excellent spot for trout and reds on colder days. “Just anchor and fish the bottom,” he said. We made several casts without success, and then yielded to the itch to move on. A boat was anchored at the junction of Crooked Bayou on the west side of the Twins, and they were landing a trout as we putted by. Dugas stuck the bow on the corner of the east side of the intersection, and we gave that corner a few casts, but again without success. We headed south down the Twins and made our next stop at the top of Four Horse Lake. We gave the area 10 minutes, and with no hits to keep us longer, we pulled up the Cajun anchor and moved on. Dudenhefer pointed to the far end of the lake and said the pass into Pato Cabello at the southeast end of Four Horse is` also a good spot on colder days. While Dugas says any of the cross channels intersecting with the Twin Pipelines can be productive, there are a few that are his favorites. “At the cuts to Round Lake, Sister Bayou and False River,” he said. “Those are all excellent cold-weather spots. Anchor just off the Twins into the corner at one of the channels, and cast your bait either into the cross channel and let it fall down to the bottom and then into the pipeline, or cast directly into the pipeline. We detoured off the Twin Pipelines and ran through False River, made a few twists and turns and wound up in another of Dugas’ winter hotspots, Bay Jack Nevette. The cuts into Oak River and Bay Ponton are excellent winter spots, and several boats had already staked their claim to the area. We moved into Pointe Fienne, and began a drift in the area between Pointe Fienne and Bay Jack. “The current really flows through here, and it dug out a deeper channel, making this a great winter-time spot,” he said. Within minutes, we had fish on, and these were some nice trout. Dudenhefer was fishing live shrimp under a cork, and the trout showed a definite preference for his offerings. But once they turned on, they hit my Berkley Gulps under a Cajun Thunder cork like they were the real thing. Dugas was also having success with a Catch 2000, so we put quite a few fish in the boat before we drifted completely out of the action. Then we ran back to where we started and re-drifted the same area with almost the same results. That’s the key this month, Dugas said. Move until you find them. Either anchor or drift until you get a few bumps, and then anchor. “Oak River is generally as far as you’ll ever have to run in winter,” Dugas said. “All of the cross channels are good spots to try, but a few are my favorites. Oak River at the Pencil Canal; at Little Crevasse; at the cuts to Pointe Fienne and Bay Jack, and at the Twin Pipelines. Those are all cold-weather spots that generally pay off. “But probably the best really cold weather spot is Oak River, between Little Crevasse and the Pencil Canal. Just drift that section of Oak River slowly, bouncing your bait easy off the bottom. For reds, Dugas says fish anywhere in Oak River where there is a drain from the marsh. Sick of the winter doldrums yet? Then head to Hopedale, where ample redfish action will make you glad it’s not summer. to get into all the redfish they can stand. February is generally considered one of the toughest months for inshore saltwater fishing in Louisiana. Although fall and early winter speckled trout fishing can be fantastic, trout seem to go dormant in the depths of winter. Strong, cold winds and low water conditions can make for uncomfortable, unproductive fishing. However, for the angler who carefully picks his location and technique, cold-weather redfish can provide hot wintertime action. Redfish are much more tolerant of cold water than speckled trout. While these two species are oftentimes caught side by side, wintertime reds can be much more active and predictable. When the trout get lockjaw, many knowledgeable fishermen turn to cold weather reds to satisfy their winter fishing needs. Many fishermen believe that redfish magically appear in the winter marsh, that they must migrate there. The truth is that they were there all along, but winter conditions make them more accessible and tend to concentrate them. Frequent cold fronts will drop water levels and provide less area for the reds to inhabit. Many a winter trout fishing trip has been salvaged by stumbling into some cold-water redfish. Redfish are primarily bottom grubbers. They make their living scouring the water bottoms rooting out all sorts of critters that end up in their powerful crushers. Crabs and shrimp are particular favorites. In times of normal or above-normal water levels, redfish will work their way into areas of the marsh that most fishermen can't access. It is not uncommon to spot redfish feeding in water so shallow that their tails and backs stick out of the water. But wintertime is different, with the water gone from all the cracks and crevices, redfish will be forced to move out of these inaccessible areas. If the temperatures are extremely cold, they will bunch up in the deeper holes of nearby bayous and dead-end canals. However, as the water warms on cold, sunny days, reds will move back into the shallower areas along the edges of the lakes, bays and lagoons to feed. Understanding their cold-weather behavior can put you onto consistent action for these bronze bruisers. Find them in these patterns, and you can have your limit in short order and be back home to thaw in front of the fireplace. One of the best locations for February redfish is the small fishing camp village of Hopedale, which is located at the eastern end of St. Bernard Parish. No one relishes the thought of a long, bitterly cold boat ride. Fortunately, Hopedale has convenient launch facilities and short boat runs through protected waters, which makes for comfortable trips even on those not-so-perfect days. There are many prime redfish areas within minutes of launching. When it comes to wintertime redfish, Hopedale has all the necessary features to make a successful trip under varying conditions. For those cold days when they are holding deep, there are numerous bayous, pipelines and dead-end canals that provide suitable habitat. On those warmer days when they move a little shallower, you can easily fish an endless array of lagoons, lakes and bays that the redfish will seek. Few anglers know this area better than Capt. Warren Dudenhefer of Dudenhefer's Fishing Charters. “Capt. Dude,” as he is known locally, is a Hopedale native who grew up fishing these waters both recreationally and commercially. His charter operation is based on Bayou La Loutre at the intersection of Dudenhefer's Canal. Just across the highway from his dock is his childhood home and the “Oak Tree” camp that was built by his grandparents in the early 1950s. Today, he rents out the Oak Tree and another camp to his overnight charter guests and fishermen who use their own boat but need a place to stay. His family used to operate Dudenhefer's Marina, which is now closed. Generations of family knowledge allow Dudenhefer to consistently put his clients on fish and to provide expert advice on fishing the entire Hopedale area. Dudenhefer loves winter redfishing in Hopedale. “The good thing about Hopedale is that the fishing is not adversely affected by the fresh water that moves into the Delacroix area during winter,” said Dudenhefer. The Caernarvon Freshwater Diversion is operated at higher levels during the winter months, and the fresh, Mississippi-mud-stained river water can sometimes make for tough fishing conditions on the Delacroix side of Bayou Terre aux Boeufs. The list of baits Dudenhefer prefers for winter redfish is short. The only live bait available at this time of year is cocahoes. The only other natural bait Dudenhefer uses is dead shrimp either under a cork or on the bottom. “Dead shrimp is a must-use if the water is muddy,” he said. As for plastic baits, Dudenhefer relies almost exclusively on the old standby, the H&H sparkle beetle. His two top colors are clear and chartreuse. “You cannot beat these baits: They are tough, inexpensive and they catch fish,” he said. He will also occasionally use the H&H original plastic cocahoe in purple/white. If you pick your days right, the water will be generally very clear. With the absence of shrimp in the marsh this time of year, the reds will eagerly devour those plastic baits. “I prefer to fish just before or on the third day after the passing of a cold front. By this time, the water has cleared up, the temperature has risen and the fish will feed more actively,” said Dudenhefer. When the fish are deep on cold days, Dudenhefer will slowly work live, Carolina- rigged cocahoes up from the middle of deep bayous or dead-ends. Areas like Middle Bayou, Bayou Robin and the various pipelines and dead-ends provide plenty of deep holes in which the redfish congregate. A depth-finder is an invaluable tool for locating such areas. “Position your boat so that you can throw your cocaho out to the middle and crawl the bait back up the ledges toward the boat,” Dudenhefer advised. When fishing these deeper areas, Dudenhefer seeks out only those spots that have an oyster shell bottom. One advantage of the low water is that the exposed banks can make finding the oyster bar areas easy. Under the right conditions and location, you can find these deep-water redfish stacked up, and can easily limit out without moving the boat. However, the redfish are not always in the deep areas. They will move into adjacent shallows with just the slightest change of conditions or a rise in the water temperature. A bright winter sun can quickly warm shallow areas by radiating through the gin-clear water into the dark sediment bottoms. The water temperature in these areas can rise several degrees in just a few hours. When this happens, the baitfish will become more active, and so will the reds. “After a string of mild days or later in the day on cold, sunny days, you will start to see mullets along the grass. That's when you move to the edges of the lakes, bays and lagoons,” said Dudenhefer. At these times, Dudenhefer prefers to use his clear and chartreuse sparkle beetles. “In darker water or low-light conditions, I use chartreuse because I believe they can see it better,” he said. He will fish the grass edges and cuts along the shore with the beetle about 2 feet under a Cajun Thunder popping cork. He will also tight-line them on either a 1/4- or 3/8-ounce jighead, depending on the strength of the current. Dudenhefer suggests trolling or drifting the shoreline of areas like Hopedale Lagoon, Lake Ameda or Lake Amedee. “The fish tend to stay together more, and once you find them you are likely to catch several in that location,” he said. Although he does not use them often, Dudenhefer acknowledges that weedless gold spoons are also an effective wintertime redfish bait. They can be slow-rolled right through the grass, and that gold flash can be deadly in the clear water. 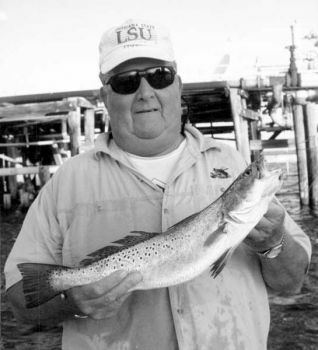 When Dudenhefer operated his family's marina, he regularly advised fishermen on all of the local hotspots. He even gave out photocopied maps of the area with over 50 of the best Hopedale fishing locations clearly marked. 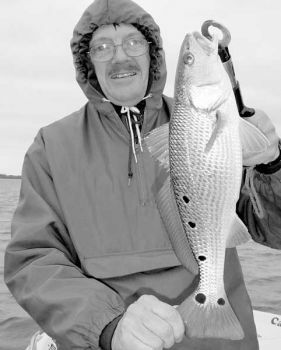 Though many charter captains would rather give you their first born before their list of hot spots, Dudenhefer eagerly marked a map with over 25 of his favorite Hopedale redfish spots. These are the same areas where he regularly takes his clients. Two full-service launches are available in Hopedale — Pip's Place and Breton Sound Marina. From either, access to these honey holes is easy through Hopedale Bayou or Dudenhefer's Canal. You will burn very little gas, and can be reeling in redfish in just a few minutes. You can also access the area from the Reggio Marina by taking a 6 1/2-mile run down Reggio Canal directly into Lake Amedee. Dudenhefer prefers to start close and work his way farther out, only if necessary. “I'll start off in Lake Ameda or Hopedale Lagoon. Many a trip has been finished without going any farther than this,” said Dudenhefer. If the fish are not cooperating, Dudenhefer suggests that you fish your way farther into the Hopedale marsh. Dudenhefer also recommends that you not overlook the larger bodies of water. “The shorelines of larger lakes, like Lake Robin and Lake Amedee, can hold a lot of redfish in the winter,” he said. Although these areas can get rough on windy days, the lee shores can provide many cuts and coves that will provide calm areas to fish. Winter red fishing can provide great sport on an otherwise useless day. You can get up a lot later since the action will generally pick up as the day warms, and it will likely not be too crowded as many fishermen do not realize the excellent fishing that can be had this time of year. Transition specks aren’t hard to find out of this Southeast Louisiana port. The fringe of Black Bay delivered some nice trout for Andy Lamont last month. The fish tend to move more inshore in September. It happens every year. Sometimes sooner, sometimes later, but inevitably it happens. Those Canadian fronts that stalled just north of us all summer long now begin to push far enough south to actually affect us. The still and stifling hot August air is shunted aside, however briefly at first, as the first wave of cooler temperatures invade. The cooler air brings along another welcome treat — lower humidity — making the thought of outdoor activity much more pleasant. And all of it sends a powerful message of change. Change is in the air. The season is transitioning from summer to fall, and like all change, it often comes with resistance. Powerful storms barrel through the Caribbean turnpike, seeking entrance to the warm Gulf waters, threatening the tranquility and safety of everyone living anywhere near the coast. That combination — cool winds from the north, storms from the south — makes for an interesting time, and for the most part, it all happens in September. That change in the weather, along with the increasing appearance of marsh minnows, triggers another instinct — the urge fish feel to migrate into shallower marsh waters. It’s not a panic that causes them to rush madly into the deep interior, but a subtle push, a nudge, along with some feeling of urgency, to seek forage in the marsh. It’s a gradual transition. At first, they move from the offshore islands and structures to the big bays and lakes close to the outside waters. They’ll feed on shrimp and the abundance of baitfish in the water, over reefs and along shorelines. As the fronts come with more frequency and colder weather settles in to stay a while, the fish gradually seek out the deeper canals and bayous of the interior marsh and set up housekeeping for the winter months. It is a scenario repeated in nature every year. It can be a frustrating month for anglers who head out to their summer hotspots, where they’ve consistently caught fish for the past few months, only to find the fish absent. That “honey hole” rig or island or wellhead that you’ve counted on all summer is now dried up. And after bouncing around to several surrounding rigs and coming away without a bite, it can be puzzling. “Where did they go?” becomes the question anglers ask most in these transition months. Oddly, our instinct urges us to hunt farther outside, in deeper and more faraway waters for the elusive fish. “Maybe the next set of rigs will have some fish, or the next set after that,” we reason. So we burn more time and more fuel, moving farther away from where the fish are all the while. Their instinct was triggered by that very first cold front to move closer in. And while you can still find some occasional quality fish at the outside spots, they’ll be much more scattered and less concentrated. Your trips will be “hit and miss,” likely with more misses than hits. The key to finding good concentrations of fish from now until winter is to work those transition area bays and lakes where the quarry you seek will be foraging. According to Capt. Warren Dudenhefer, Hopedale has an abundance of such waters. Dudenhefer operates out of his camp next to the Hopedale Marina. He invited me to fish along with him and an old banking buddy, Andy Lamont, on a foray into some of these transition bays out of Hopedale. We met before daybreak at Dudenhefer’s camp, virtually next door the Hopedale Marina. Old timers will remember it as Dudenhefer’s Marina, as it was named by Warren’s father, Gene Dudenhefer, back in the early 1970s when he first built and opened the marina. Warren literally grew up on the shores of Hopedale, fishing with his father and his grandfather since he was old enough to walk, and “loving every minute of it,” he says. Though his family now leases out the marina, Dudenhefer continues to hold his affinity for the Hopedale waters, and has been a guide for several years. Our plan was to head outside first and fish the closest-in rigs and structures we came to. Dudenhefer said he’d been nailing some sizeable trout at those structures over the past several days, and he wanted to see if they were still there. Dudenhefer had us fishing with live bait, either shrimp or croakers, both under a popping cork and under a sliding sinker. We figured if they started hitting one rig rather than the others, we would all switch over to what worked. We caught a couple of nice trout almost immediately, and then the action died. The anchor hardly had time to grab before Lamont caught a trout. These were even nicer fish than those from the previous rig, and we managed to put several in the boat before Dudenhefer hooked a monster redfish. The fish fought for at least 20 minutes, running, diving and doing its best to pop or shake the line. Dudenhefer managed somehow to keep it out of the legs of the structure (the 30-pound braided line he had spooled on his reel helped immensely), and we eventually netted the brute. High-fives were exchanged all around, and we posed with the big fish for several photos before returning it to the water. We were all glad to see it swim immediately away, to spawn and fight another day. The big red tipped Dudenhefer’s scale at 30 pounds, and easily looked and felt like it could’ve weighed 40 pounds or more. With our craving for a few monster fish satisfied, we headed into Lake Fortuna to pursue some of the schools of foraging trout that were marauding up and down the shorelines of Fortuna, Lake Machias, Lake Calebasse, Lake of Two Trees and Lake Coquille. These bodies of water, according to Dudenhefer, are the places to ply your baits not only this month, but from now until winter. We followed his advice, and got instantly into a good school of trout. These were nice fish, too, not the kind you have to measure. “I look for several things to indicate the possible presence of fish,” Dudenhefer said. “I look for baitfish or bait activity on the surface, especially along shorelines, at corners and cuts. Wherever you find bait, you’re likely to find trout or redfish, so fish there. Pop your cork, make some noise, and give a spot 10 or 15 minutes to produce. If you don’t have a bite after 15 minutes, the fish just aren’t there. Move on. “I also look for clean, moving water. If the water is all muddy, or if there is no tide, you’re going to have a lot of trouble finding fish. The only thing you can do is to try to fish on days with a decent tidal range, 6/10 of a foot or better. You can catch fish on lesser tides, but not as consistently. Another of Dudenhefer’s techniques is to fish the lee side of a shoreline, rather than the windy or rough side. Dudenhefer marked a number of spots on a map I handed him, all of which he says have been productive for him in the past. “All of these spots are liable to hold redfish, trout and flounder this month,” he said. “Just take your time, fish the spots on the map with live shrimp or live minnows under a popping cork, and you will catch some fish. We were still putting trout in the boat. Virtually every cast resulted in a solid strike, and our tally for the day was quickly mounting. We were all having visions of fish frying, hush puppies and tartar sauce. Another boat was anchored some 50 yards away from us, and we could tell by all the whoops and yells that they were onto a good school of trout as well. But that was about the same time we started to hear the ominous rumble of not-too-distant thunder. Nobody likes to leave a spot when the fish are biting as fast as these were, but our conditions were quickly deteriorating. The sky had suddenly darkened and the cool wind of rapidly falling temperatures warned us that bad weather was near. A dark, wide thunderstorm was moving rapidly in our direction and spreading so fast it threatened to shut off our escape route. Lightning bolts repeatedly sent thunderous claps echoing across the bay, and we upped anchor to high-tail it to the dock. We should have left five minutes earlier. The wind and the rain weren’t the problem. We have rain suits and storm anchors for just such occasions. But lightning is another matter. On a boat in an open bay, or even hiding from waves behind a marsh island, you are still the highest point around, and lightning generally strikes the highest point. Dudenhefer had the 225 Honda wide open when another, even more ominous event occurred. Right alongside of us, a dark funnel descended from the thunderstorm, and headed in the very direction we had to travel to get home. This was no tiny waterspout, but a genuine tornado, reaching down from hundreds of feet in the air. I managed to shoot a few photos before the driving rain got to us, and Dudenhefer was able to keep us far enough away from the dangerous funnel cloud to keep us safe. As we left it in the distance, it slowly ascended back up into the clouds. We arrived back at the dock wet, but with a good box of nice fish, and an experience none of us will soon forget. Now, if September will spare us from tropical storms and hurricanes, we’ll all enjoy some of the best fishing Louisiana has to offer. Capt. Warren Dudenhefer can be reached at (504) 676-3724 or (504) 813-FISH.